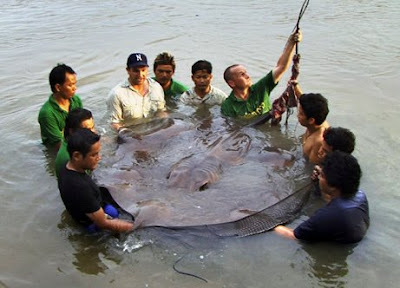 Ananka's Diary: You Call Those GIANT Stingrays? Pshaw! My sister got stung by a sting ray the other day. but it was only small so she was all right. Oh, i the other day i stepped on a sea urchin. it was dead though. I've only been to the sea once since I live in ohio (which is a dreary place to live) but when we were there we collected a ton of these small, dead jellyfish and made patterns with them in the sand. I don't have any extreme fear-factor sea creature tales, but one of my friends is so scared of sharks! Her parents recorded a tape of her screaming in the shower because she thought she saw a shark. Gasp! This is letting me leave comments! Once in South Caroline there was a huge moving rock in the ocean. It had eyes, and was very scary. I thought I saw a Great White Shark once when I was surfing. I think it was a false alarm though. sadly, no i haven't ever had an encounter with a scary ocean animal! I think I stepped on a sting ray once because I was in the water walking and I stepped on something slimy and rubbery. I screamed and jumped onto my dad, who was safely on the float. Not cool. And I am scared to death of jellyfish. Giant Squid Has Biggest Animal Eyes in World= Woooohooo!!! sweet... he he he weird laugh. I have a friend scared of dolphins. Yea, I know. She also hates jellyfish because she stepped on a dead one. Does anyone else think that USA Today smells like pickles? My mom almost got stung by a stingray before (in SeaWorld! XDD). And uhh... I think I said this before, my sister cut her foot on a rock while snorkling and got chased by a shark (a baby one, thankfully tho!) No scary encounters of the sea creatures with me... Well, I pocked a dead jellyfish before (I didn't get shocked tho.. ^^').. It was squishy and slimy. Oh yeah! Happy Children's Day (a Chinese holiday on May 1st, the kids get a week off from school)! I really can undersrtand why your scared of them! I'm scared off most big creatures. But aside from that, I'm not a very scared person. OMG... That was a BIG stingray! Well, I'd be totally freaked out if I saw one of those, even though I'm usally not scared of watercreatures, except sharks... And dead spiders in the bottom of my backyard pool. They are REALLY, REALLY scary! You know the stuff that cures acne? Is there any way to whip some up at home? The first post is about Kiki Strike. I almost stepped on a jellyfish once. Does that count? Terrifying encounters? If you count the one time that someone told me the little squiggly black things on the safety-boundary ropes were leeches, then yes. But I think he was fibbing. no. i love the ocean, i love hearing about shark attacks, and (ok, so) i do tend to get freaked out anytime I'm in a twelve ft deep pool by myself. i dunno what the deal is. but yeah. i have other peoples stories. like my aunt was in mexico and she was in the ocean and she stepped on either a jelly, sea urchin or stingray then stepped back and fell on a stingray or jelly. and then once i was on the west coast with my cousins and grandparents and me and my cousin found this washed up dead jelly (dont ask, we are a weird family) so my cousin picked it up with a stick and flung it out into the ocean. yep, we're weird. Carry No Seal: Thank you!!! Elizabeth: That's fabulous! I've added you to the blog list.